If your product starts in coil form from a mill supply, BPC has equipment to process coil into cut to length straights. 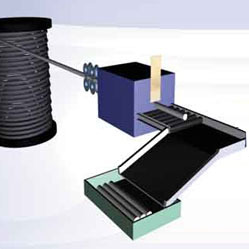 As a result, straightened coil is then accurately cut via a flying shear to lengths from 2' to 20'. The ability to de-coil and cut to length products ranging from 3/8" to 1 1/8" in diameter gives BPC the ability to process large coil into straight lengths suitable for finishing operations like turning and non-destructive testing to assure defect-free material.